What exactly is buyer persona development? Recently, this question came from several who have “done personas” but have met resistance or disappointment. Our discussion centered on why the buyer personas developed offered little value. In my conversations helping people, there are two reasons why buyer persona efforts have been met with either resistance or disappointment. Buyer personas are perceived as a customer profile. A customer profile with a picture offers little value. Sales intelligence is misperceived or misrepresented as buyer insights. These two reasons can result in resistance and disappointment. While a customer profile can help with understanding buyers, they will not in be revealing about buying behaviors. Nor will they offer any illuminating buyer insights. If they contain sales intelligence information, resistance can be quite strong from sales since it is information they have worked with for years. And, even when armed with such information, they struggle to be effective. The term “buyer persona” has become more familiar over the past few years. The true meaning also has been prone to distortion. 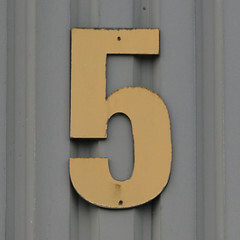 The term is meant to represent the development of 5 very important components designed to inform buyer strategies. Without these, you will not have buyer personas but buyer profiles. What Are The 5 Core Components? Buyer persona development is a part of overall buyer insight research. The aim here is to understand buyers deeply. At the core is insight into goal-directed buying behaviors. Understanding the gaps buyers have in fulfilling goals is at the heart of buyer personas. These gaps also should connect to solving a problem statement. This component involves qualitative research-based buyer interviews. Related to the second reason for little value is the misperception of win/loss interviews as qualitative research. This type of interviewing is designed for sales intelligence. 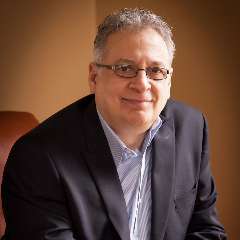 It is not a substitute for the use of qualitative research techniques, such as ethnographic research, which can help you uncover game-changing unarticulated and not-so-obvious buyer insights. The use of archetypes is very important to the buyer persona description. The use of archetype modeling is a powerful tool and concept in the social sciences. 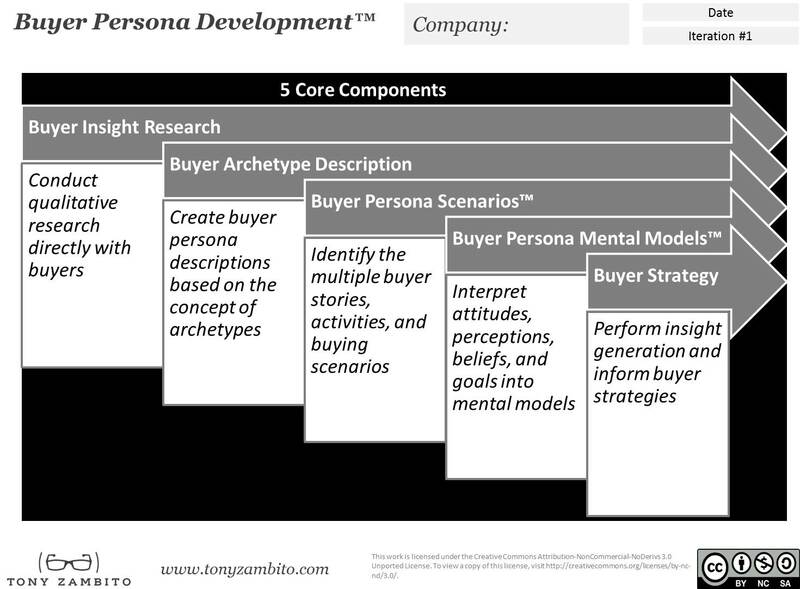 Buyer persona archetypes serve as a communications platform to capture insightful findings of buyers. The attempt here is to develop archetypal representations of your buyers. The attributes of your buyer within a targeted segment, for instance, are described. Central to buyer persona descriptions are stories of goals and goal-directed buying behaviors. Avoid the common mistake of thinking of buyer personas as descriptions of job roles, titles, and functions only. There have been many templates made available for a buyer persona. With nearly 100% being templates for profiles. I recommend avoiding templates all together and developing your own buyer persona archetype description in the best way it tells the story of your buyers. You add value when you put buyer personas in action. Buyer scenarios are used to describe the research-based activities, tasks, and workflows buyers use to accomplish specific goals. They are a collection of the many buyer stories taking place within an organization. The aim of buyer scenarios is to help communicate the how and why of what buyers do to accomplish their goals. This can include some aspects of the buyer’s journey or buying process. However, this technique allows you to not be constrained to this limited view. It is especially important for content marketers to not be constrained in this manner and really understand the stories of their buyers. The use of mental modeling can reveal surprising patterns of attitudes and beliefs. Buyer mental models are perceptions and internal images of reality buyers have on how things are, how they work, and how we interact. These are extremely important for they guide thinking and decision-making around how to achieve specific goals. Buyer mental models are an interpretation effort. They represent a qualitative research-based collection of attitudes, beliefs, perceptions, assumptions, experiences, and goals. Helping us to understand the toughest question about buyers: how do buyers think? This is often the hardest component of buyer persona development to both acquire and learn. Buyers often have a hard time articulating what truly is on their mind. It takes much practice and skill to dive into the world of the unarticulated. This component consists of two very important steps. The first step is insight generation. Distinctive deep buyer insight is a result of a journey through the first four components. The real key to insight generation, and what the first four components are designed to do, is to help us understand the gaps buyers have in fulfilling their specific goals. The second step relates to the first, which is to turn insight into informed buyer strategies. What buyers seek is foresight into better means for achieving their specific goals. Buyer strategies, informed by the above four components, can do just that – articulate why buyers can better fulfill and achieve their specific goals. Truly mastering buyer insight research and buyer persona development involves the use of these five core components. Buyer personas can only add value if they are researched-based and not based strictly on traditional customer profiling or sales intelligence. If you have “done personas” and experienced little value, I suggest checking to see if you have these 5 core components. Buyer persona development can be very useful to many areas of an organization including marketing, sales, strategy, and service. True value comes from everyone in the organization knowing who customers are and how to help them accomplish their goals. It may be hard to believe, but customers and buyers want you to take the time to know them too.